My First Granola Recipe The first time I made granola, I found myself researching for an easy cooking method and just what ingredients should be included in the granola. There were many recipes I found so I gathered from all of them what I liked, merged cooking methods. Next I wrote my own recipe that I believed would work well. With that recipe I created my very “first homemade granola”. Merging at least 12 recipes into my own creation. Since that first baking of this granola, I’ve made this about once a month and I do experiment with ingredients based on what’s on hand at the time. Why you should make granola yourself After I made my first batch of granola I realized that I had greatly over spent for years on boxed granola. 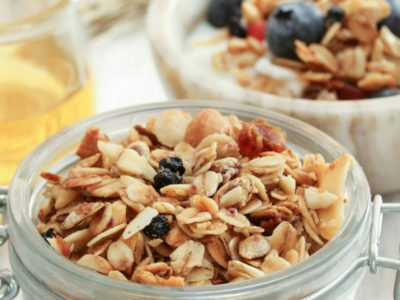 You can’t beat the fresher flavor of homemade granola! You are the boss when it comes to cooking! You know your tastebuds best! Experiment!! I love creating in the kitchen which is playtime for me! The best part of making your own is it’s exactly to your taste with the fruits and nuts you love best! And did I mention that the house smells amazing too?